To manage your account and search for physical and electronic resources - Log into Oliver Library. You can come into the school library and use the Oliver OPAC Circulation Kiosk to find resources. The kiosk is located in the centre of the library and the screen looks like the Oliver home screen above. You can search for resources by browsing the shelves. Our Fiction section are arranged by GENRE and then by author's last name. Our Genres include: Adventure, Australian Stories, Classics, Crime, Fantasy, Graphic Novels, Horror, Humour, Mystery, Romance, Sport, Supernatural, Teen Fiction and War, amongst others. You will see that our Non-Fiction resources, like many libraries are arranged according to the Dewey Decimal Classification system. Dewey groups these books by their subject content. Dewey Decimal Classification. 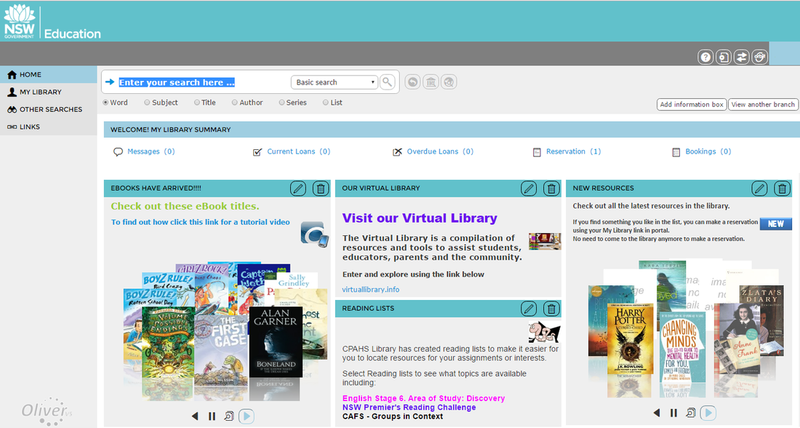 See the slideshow below to see how Dewey works and how resources are arranged.